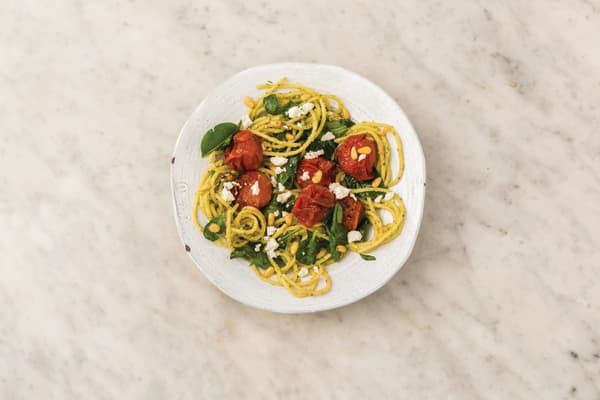 The caramelised cherry tomatoes provide delicious bursts of sweet goodness as you tuck into this warming bowl of pasta. Hints of tangy goat cheese and buttery pine nuts add a touch of class and compliment the pesto perfectly, just as they should. Belissimo! Preheat the oven to 220°C/200°C fan-forced. Bring a large saucepan of salted water to the boil. Place the cherry tomatoes, balsamic vinegar and olive oil (1 tbs for 2 people / 2 tbs for 4 people) on an oven tray lined with baking paper. Toss to combine and season with a pinch of salt and pepper. Roast on the top rack for 15-20 minutes, or until blistered. 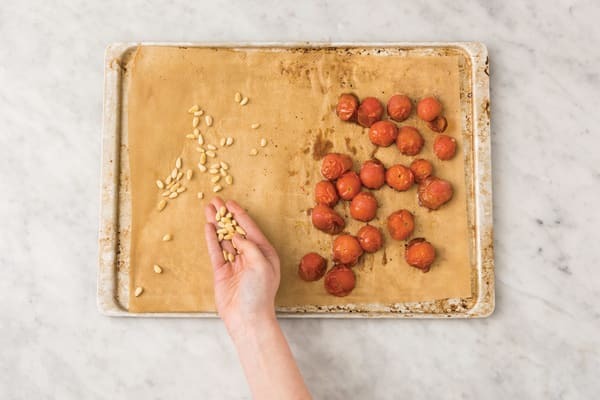 In the last 4-5 minutes of cook time, add the pine nuts to the side of the oven tray to toast. 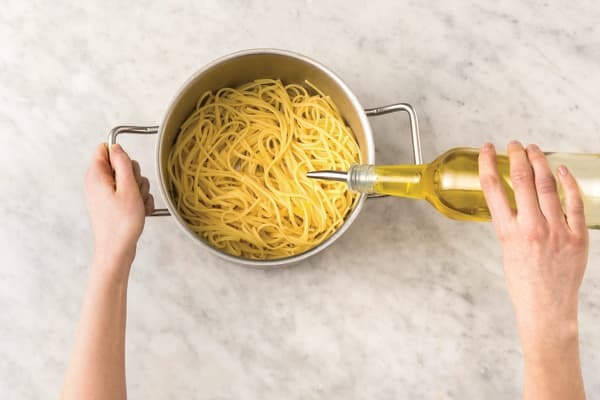 Add the spaghetti to the saucepan of boiling water and cook for 8 minutes, or until ‘al dente’, stirring occasionally to ensure the pasta doesn’t stick. 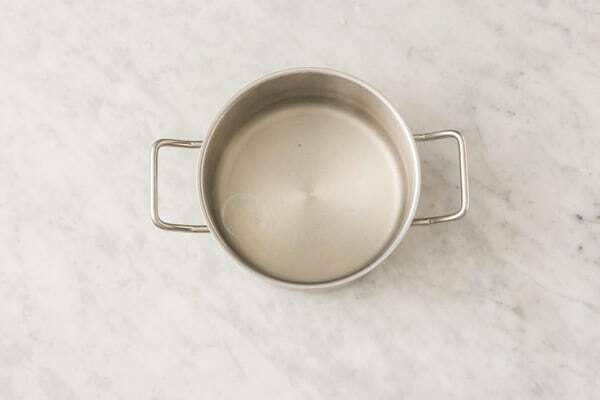 Drain, return to the saucepan and add a drizzle of olive oil to prevent sticking. Using your fingers, tear 1/2 the goat cheese into small chunks. 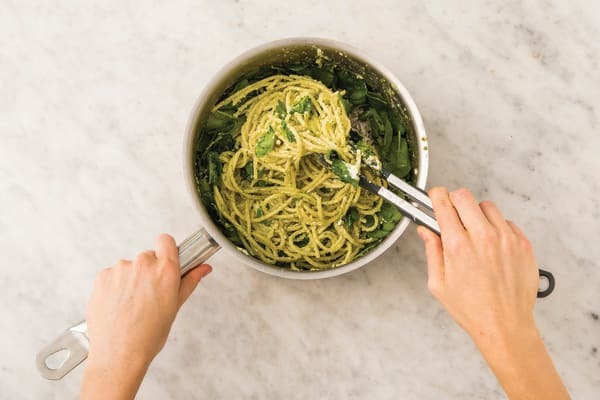 Once the spaghetti is back in the saucepan, add the traditional pesto and torn goat cheese and toss to combine. Add the baby spinach leaves to the spaghetti and toss until slightly wilted. Season with a good grind of pepper. 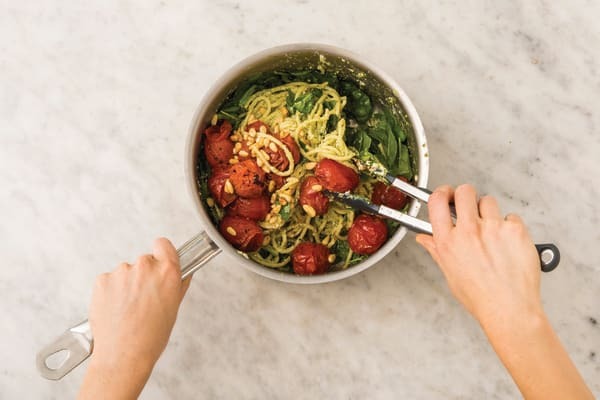 Add the pine nuts and roasted cherry tomatoes (and any tray juices) to the spaghetti. Gently toss to combine. Add a small squeeze of lemon juice and season to taste with salt and pepper. TIP: Seasoning is key in this dish, so taste and add a little more lemon juice, salt or pepper if you like! 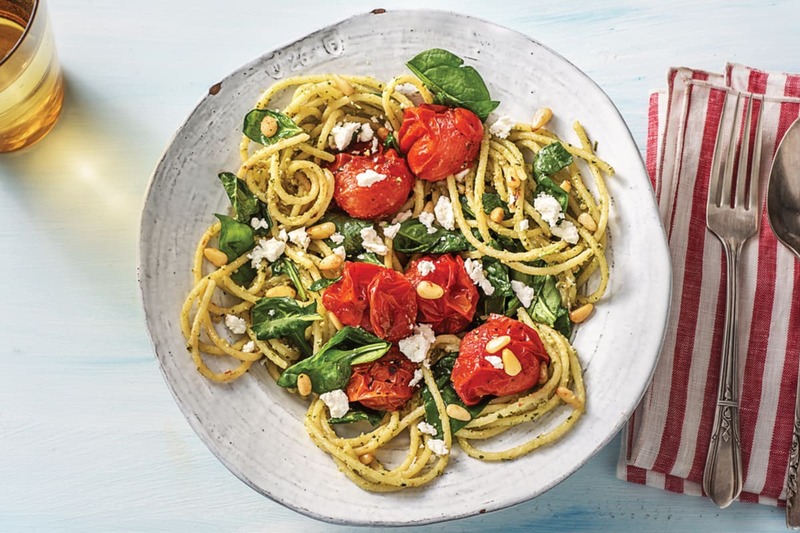 Divide the pesto spaghetti between bowls and garnish with the remaining goat cheese.